I love hanging lights! From lanterns to lights strung through trees I think lights make an outdoor space so warm and inviting! 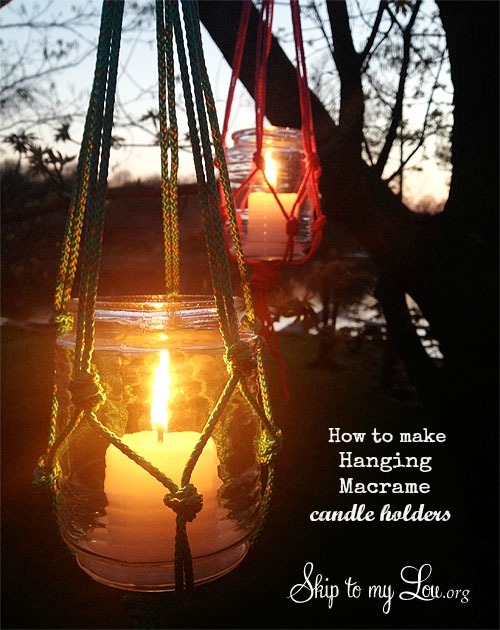 These hanging macrame candle holders are so simple to make. Lowe’s has everything needed. 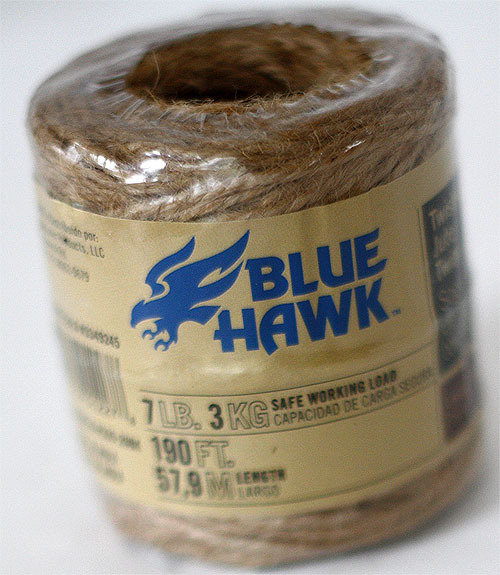 Lowe’s has an amazing array of colorful nylon cord. Can you imagine?….these candle holders could be made to match any decor or party. I am thinking red, white and blue for the Fourth of July! Not in to color? Twine would make beautiful natural looking holders! 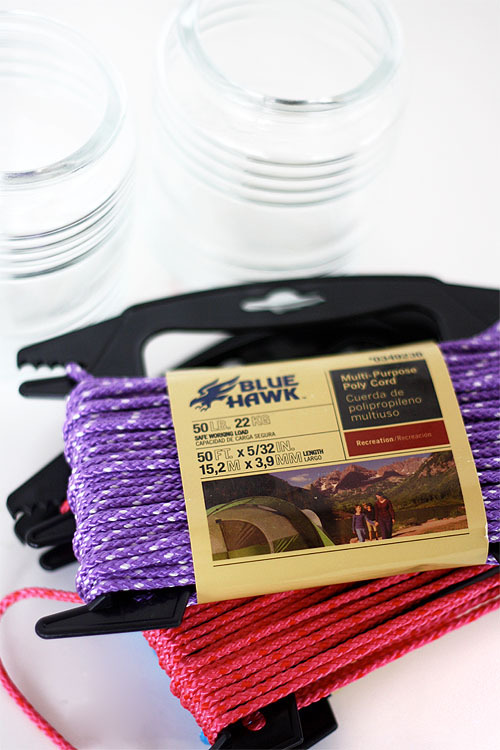 So grab some nylon cord and some glass light bulb covers (found in the lighting section) and you are ready to go. You will also need a metal ring for each holder. 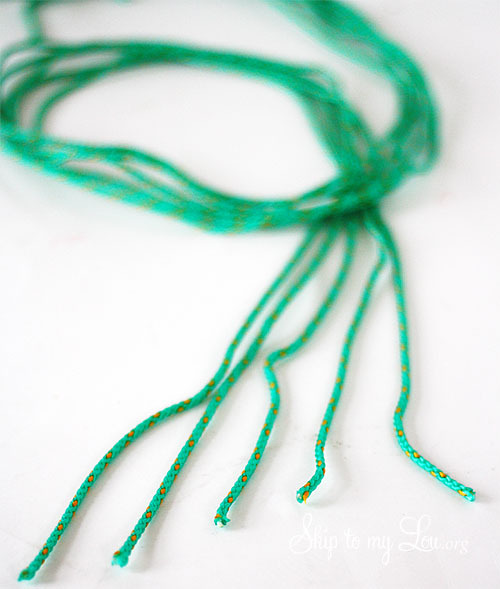 Cut the cord into 5 pieces each 75 inches long. Gather the cords together and feed through the metal ring. 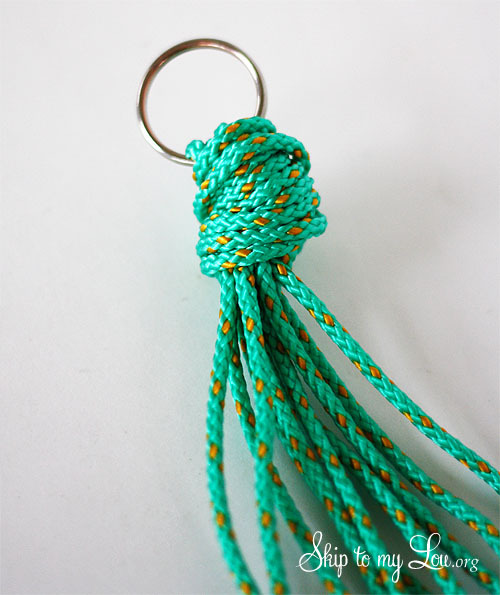 Place ring at the center of the cords and tie a knot below the ring. 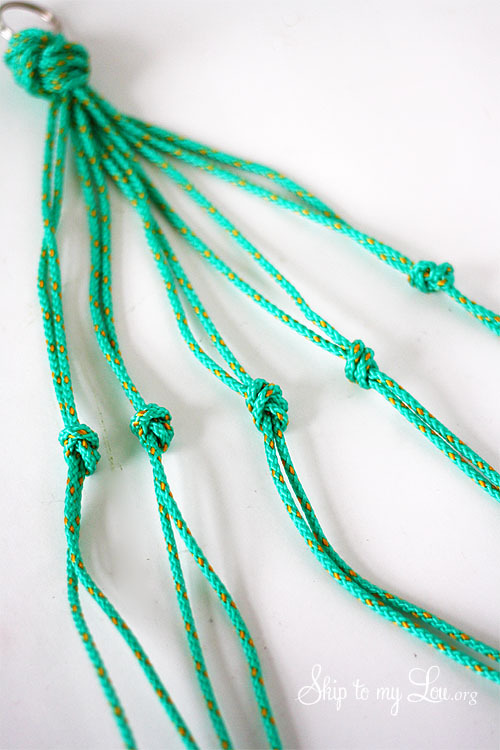 Take two cords next to each other and tie a knot 8 to 10 inches down. Do this to all the cords (5 knots). Take a section and measure about 2 inches below the knot. Tie one of the cords from that section to one of the cords from the next section. Do this for all sections, until each piece is tied. Gather all the cords together and measure about 4 inches down and tie a knot. 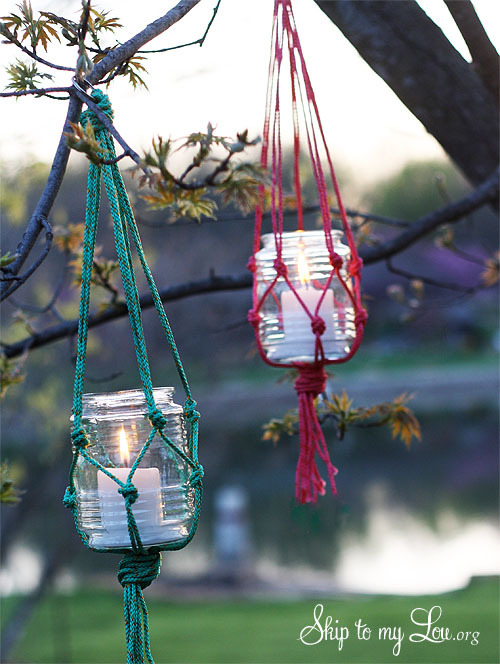 Place glass light bulb cover in the holder, add a candle and hang from a sturdy branch! If you are looking for ideas to beautify your outdoor space Lowe’s has all the tools you need to be creative. Check out their Lowe’s Creative Ideas blog and be inspired! 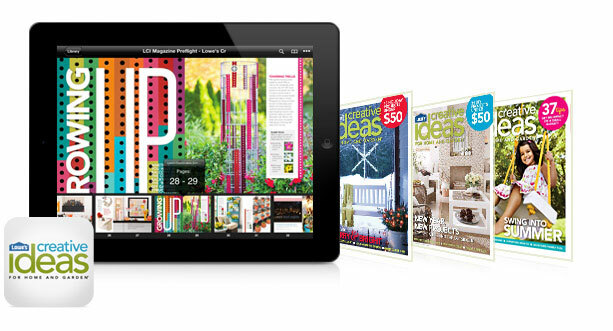 You can find Lowe’s Creative Ideas on Facebook and don’t forget to pick up a FREE Subscription to Lowe’s Creative Ideas Magazine. Their magazine is fabulous! Thank you Lowe’s for being my go to place and for supplying me with a gift card for this project! This is just awesome, i will definitely try this. Thanks for sharing!! 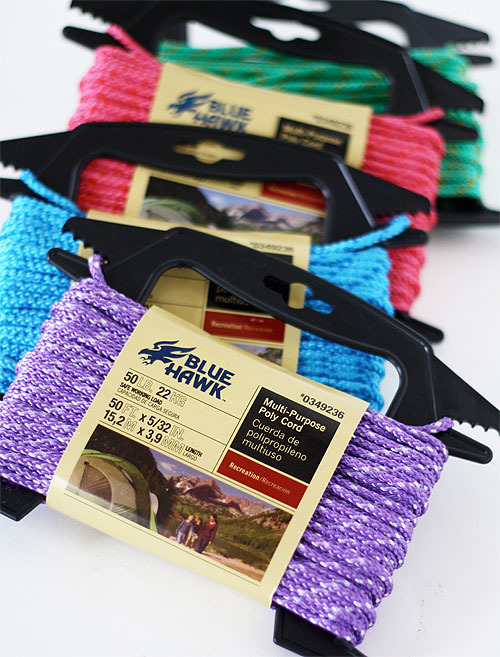 Thanks for sharing this.. i've tried to do the rope ties before on a bottle but everytime I tried the rope just wasn't enough.. Will defo be trying this wihth the poly cord asap and can't wait to hang lights on the trees in the gardens of friends and family.. I am definitely having a 70's flashback! I used to make these all of the time for hanging plants. I never thought of using them to hang candle jars. What a great idea! I have twine, I have jars, I have candles. Looks like a fun weekend project!! This was a great project. It took me about 35 minutes to complete. It was a lot of fun. 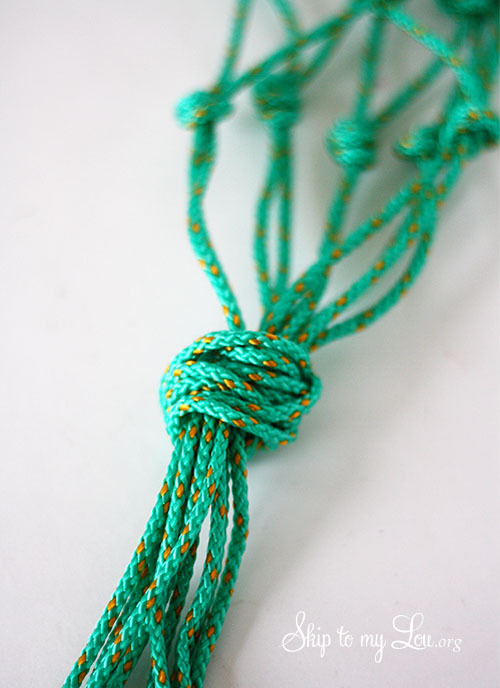 I am going to make another one but I am going to tie more knots in this one making a tighter net. im just ending my year for 6th grade and im gonna hold a party for m friends at my house. i have a very small house and an extremly foresty are so this is PERFECT! thank you!!!!! I love this idea. 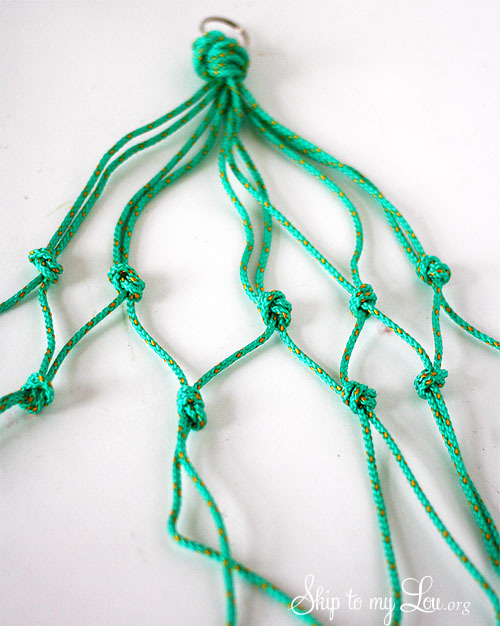 I have also been looking for a macramé pattern to hang a plant in my bathroom. lol I think I may do several of these and use the fake candles, which you can turn on and off by remote control. I love those. If it isn't bright enough I will use real candles. Thank so much for the great ideas. Light bulb holders? Could I use mason jars? I haven't done macrame for years but these would look great on my front verandah! Yes, mason jars or any glass container that is heat safe would work! I may just have to make these with my kids today! You are amazing Cindy! Those look so festive! These are so pretty. Reminds me of the macramed plant hangers of the 70's - only these are so much prettier. TFS.